Transdiesel Australia is fully accredited to perform warranty servicing and repairs on all model Allison Transmissions (including Hybrid). 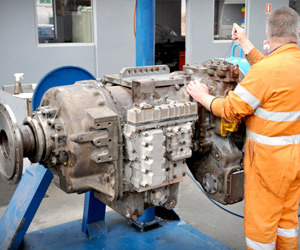 All Allison series transmissions can be overhauled and tested at Transdiesel Australia. Our purpose built facility in Melbourne covers over 1650 square meters and is equipped with the latest electronic equipment technology including an AIDCO Transmission Evaluation Centre (including 450E Test Stand with Powernet TD Data Acquisition and Controls) as well as a 500 HP engine driven transmission test stand. This latest electronic equipment technology enables to perform final inspection and conduct troubleshooting in a fast consistent manner. Transdiesel are able to provide field service support with our team of highly skilled technicians available to travel within Australia on the same day. Assistance is also available to customers for any Allison Transmission related issues, including cooling system, drivelines, electronic controls and any other integration issues. Transdiesel are experts in keeping Allison Transmissions running in optimal condition throughout their life-cycle. We offer the full range of routine service and repair options for Allison transmission customers with warranty accreditation on all work.